The impacts of the migration of enterprises and other organizations into the cloud continues to ripple through the IT industry, with two reports reiterating the how central the compute model has become to enterprises’ strategies. Gartner analysts said this week that the global public cloud services market will grow 17.5 percent this year, reaching $214.3 billion in 2019. Last year it was $182.4 billion. 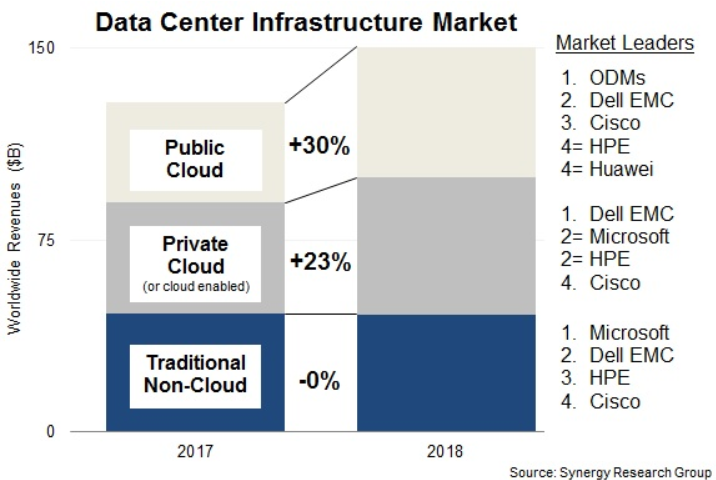 At the same time, analysts with Synergy Research Group highlighted how the top public cloud vendors, such as Amazon Web Services (AWS), Microsoft Azure and Google Cloud Platform, are increasingly becoming key drivers behind data-center hardware and software spending. Worldwide, such spending in 2018 increased 17 percent, with public cloud services and the need for richer server configurations – due to increasingly complex workloads and the push toward private clouds – being among the factors fueling the spending growth. The spending on public-cloud infrastructure jumped 30 percent over 2017, the analysts said. Both reports are additional proof points that more data and workloads – and the changing nature of workloads that are increasingly leveraging such tasks as artificial intelligence (AI), machine learning, analytics and virtual and augmented reality – are moving into the cloud to help increase efficiencies, reduce costs and improve operations. “Cloud service revenues continue to grow by almost 50 percent per year, enterprise SaaS [software-as-a-service] revenues are growing by 30 percent, search/social networking revenues are growing by almost 25 percent, and e-commerce revenues are growing by over 30 percent, all of which are helping to drive big increases in spending on public cloud infrastructure,” said John Dinsdale, chief analyst at Synergy Research. The numbers from Gartner and Synergy Research reinforce what analyst firms, vendors and channel partners have been seeing for the past several years. Most recently, IDC analysts in February projected that spending on public cloud services and infrastructure this year will hit $210 billion – a 23.8 percent over 2018 – and will reach $370 billion in 2022. Multiple recent studies have shown that many enterprises are not only adopting the public cloud, but pursuing multicloud strategies that call for using more than one public cloud provider. Network analytics vendor Kentik in January said 58 percent of survey respondents claimed to use more than one provider, with 18 percent saying they were using AWS, Azure and Google Cloud. In its own study, Flexera found that 84 percent of companies have multicloud strategies. Such survey results help explain the spending numbers that Gartner, Synergy Research and others are finding.